The L’Aquila earthquake occurred the 6th April 2009, causing several casualties and damages to a large number of buildings and infrastructures. The event was a 6.3 moment magnitude (Mw). In the days following the earthquake, several aftershocks with Mw>4 affected the same general area. In total, within an area of about 50 km radius from L’Aquila town, the seismic sequence counted ca. 2×104 events in about one year. Among the severely damaged infrastructures, an important water pipeline (900 litres/sec, pressure 40 bars) located ca. 5 km ENE from L’Aquila town (near the Paganica village) was also partially destroyed during the major event. The damages were likely produced by surface co-seismic displacements due to the Paganica fault slip occurred at depth, as the pipeline runs perpendicularly across the estimated position of the fault trace at surface. This pipeline supplies drinking water to the town of L’Aquila and neighboring villages, thus its temporary interruption caused further problems to the population of that region. In this scenario, the attention was also drawn to potential post-seismic displacements that could cause further damages to the water pipeline. The 24th April 2009, the CNR IRPI installed a Robotized Total Station (RTS) to provide continuous monitoring of the displacements at the water pipeline and neighbouring zones. The monitoring network was settled up to measure the post seismic displacement that could cause new damages to the pipeline. Since the pipeline has been likely damaged by displacements at the surface caused by fault slip occurred at depth, thus the knowledge of the surface fault trace position, as well as the faulting mechanism was a key element during the installation of the network. The monitoring network was active for a year and the dataset was also compared with the independent space-based geodetic measurements (SAR). aftermath the critical monitoring target was the water pipeline, mainly due to its hazard potential. Indeed, the results of the RTS measurements are relative to the location of the station and of selected reference points, considered as stable over time. The project was aimed to study the L’Aquila earthquake post-seismic surface displacements via RTS measurements acquired during one year. The obtained results show that some of the monitored prisms had a relative motion with respect to the RTS. The displacements decayed exponentially and reached about 2-4 cm of cumulative value within our observation period. The comparison of the RTS measurements to the surface displacements relevant to DInSAR time series defined that the motion recorded at the prisms was actually caused by the motion of the zones where the RTS and the reference prisms were installed. 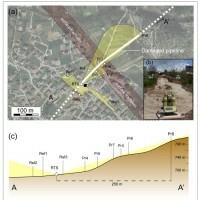 The study and monitoring of Paganica fault displacement was used to control the safety of the water pipeline. The results of the robotized total station measurements were analyzed and transfer in dedicated periodically reports to the Nation Civil Protection Agency. From the scientific point of view, the measurements were used to have a high frequency control of the fault displacement. 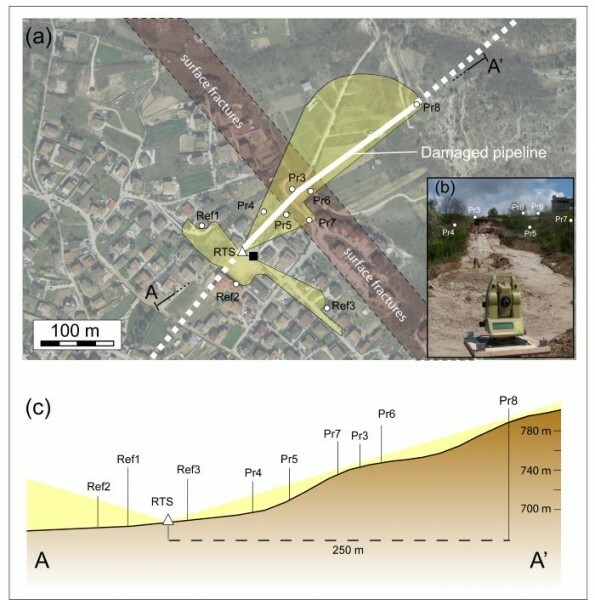 The project was aimed to monitor and control the post main shock evolution of the Paganica fault using a robotized total station. The April 6 2009 earthquake damaged the water pipeline and interrupted the water supply of the entire L’Aquila region. After the remediation work, a monitoring of the stability of the pipeline was settled on. The monitoring system allowed to measure the post main shock evolution of the fault also comparing the ground deformation dataset with the DInSAR results.